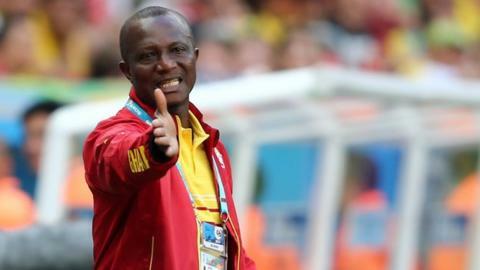 Coach Kwesi Appiah insists he is happy with Ghana's performance at the World Cup despite finishing bottom of their group and failing to win a match. The Black Stars' campaign was also marred by a bonus row and indiscipline that led to Sulley Muntari and Kevin-Prince Boateng being sent home. "I am very happy with the performance of the young players I brought to the tournament," said Appiah. "And I am building a better future for Ghanaian football." Ghana lost 2-1 to United States in their opening match in Brazil and then drew 2-2 with Germany to leave themselves an outside of chance of qualifying from the group. But their preparation for the final match against Portugal, which they lost 2-1, was hit by a player boycott of training and then the expulsion of Muntari and Boateng from the squad for verbal and physical assault, respectively. Appiah said: "The money row was to do with the appearances fees, which are normally paid before even the competition starts. Unfortunately that did not happen and resulted in some issues - the team did not train the whole of Tuesday. "No coach wants to be in that situation, we want the players to concentrate on the game not on money or other issues." However, Appiah believes there are many positives to take from the tournament and is optimistic about the future. "Many of this t team are are really, really young," he said. "Most of this team have been together only one year. "I took most of these players to the Africa Cup of Nations [in 2013] and then I brought them to the World Cup. I believe their performance and their confidence will rise each time. "I believe their performance (in Brazil) has been really good, it's just unfortunate we did not go through to the second round but Ghana did not do badly. "Sometimes you can play well but one moment can lead you out of the competition. "Every Ghanaian loves football and would love to see their country go to the next round. But at this level anything can happen - even the best team in the world can be eliminated from the competition. "I have learnt a lot about my team's performance on the pitch and I think the players have learnt a lot and will try to develop and learn from their mistakes."